So I decided to take a break from my very busy schedule and spend a day in Valencia with a friend. There are various options to get to Valencia from Madrid, but I opted for the cheapest – the bus. I’m usually not a fan of taking buses on long-haul journeys, but I really wanted to see a different part of Spain and I didn’t want to dish out a lot of money for it. I left Madrid at 7:00am on a Saturday morning and the sun was nowhere in sight. Thankfully the bus wasn’t crowded and the seats were plush. My only concern was that my Avanza bus had no bathroom. I immediately went to the bus driver and expressed my concern in one of the only few phrases I know in Spanish. “No Banos?? ?” “4 hours and No Banos?? ?” The bus driver unapologetically told me no and pointed to where the closest bathroom was. I departed the bus and used the bathroom one last time and prayed that my overactive bladder would cooperate. Thankfully we stopped midway through the journey so we could have a smoke, café, or simply relieve ourselves. In between my naps, I was able to see the beautiful Spanish countryside which was a combination of lush green fields complimented by brown farm lands. 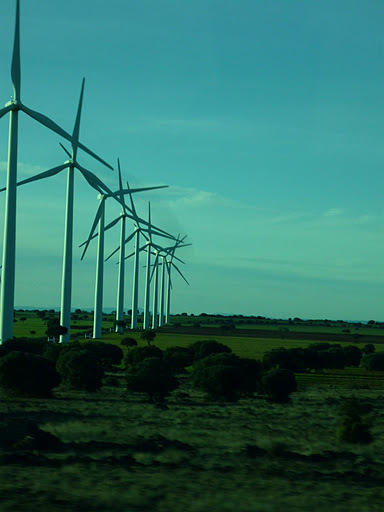 I was also excited to see several wind farms – something I had only seen in pictures and in movies (Volver), but never up close. When I finally arrived to Valencia, I was greeted by weather in the 70’s (20c). I was hyped to take my jacket off and put my shades on. My friend greeted me at the bus station and we took off to the beach. The weather was not quite warm enough for swimming, but it didn’t stop people from sunbathing, playing games, having drinks at one of the cafes, or doing a number of other sporting activities. As I walked around and chatted with my friend, I noticed how diverse Valencia was compared to Madrid; a sight I no doubt welcomed. I didn’t feel out of place or that people were looking at me strangely. After walking around the beach, we headed to the science center. I felt like I transported from the old world into the future. The science center is an amazing place with some futuristic architecture containing museums, theaters, and even a sporting facility. I didn’t go into any of the buildings. Perhaps I will save that for another trip! After checking into my hotel and dropping off my small bag, we headed into central Valencia where we embarked upon plaza after another, a classic arena, the post office, and government buildings which were all very typical (so I’ve been told). What I found most interesting on my visit into central Valencia was the protest. I took photos and videos of people preparing for and participating in the protest. One of my prize photos was a girl with a Banksy poster talking about cuts – I’ve posted it below. As my friend said – the new prime minister has just stepped into office and already people aren’t giving him a chance. 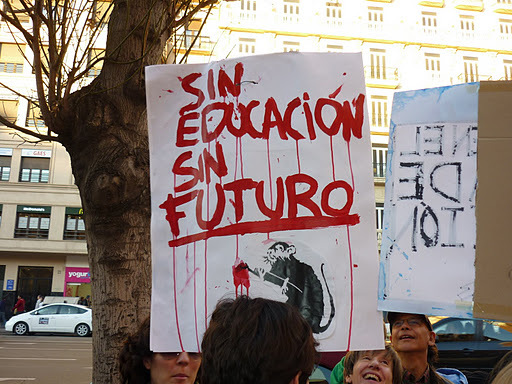 However, as a student of mine reminded me today, it’s the same people in government so the issues that were there before continue now – in fact with the austerity measures the situation is getting worse. After a nap and a wardrobe change, I headed back out to meet my friend and one of his friends. I munched on some Spanish tortillas and croquettes at 11:30pm (typical dinnertime for Spaniards) then we headed to some bars/clubs for drinks. The same relatively empty streets we meandered through earlier were packed and buzzing with people. The bars/clubs were crowded but we made a go at one playing some good music. I’m not into clubs and I really don’t like to be packed together like sardines, but I endured, two stepped, and hummed along to the music before I decided that I really wanted to go back to my hotel. After finally get back to my hotel after some detours, I went to sleep, checked out of my hotel, and headed back to Madrid on my coach! 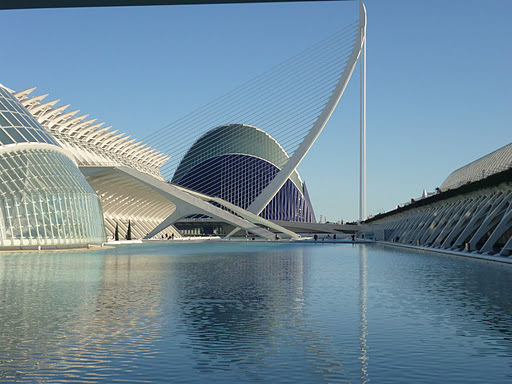 My recommendation – visit Valencia for a weekend if you are living in Spain. If you are coming to Spain and plan on going to the East Coast, make Valencia a part of your stop. It’s an amazing city that is not lacking in character!